We’ve been experiencing very fine weather and, oh, how I’ve missed it! While my Aunt & Uncle were here we had a run of sunny, blue skies for several days, then a return to cool grey. It did not last, and the last week it has been warm and dry – the perfect Easter weather. If it lasts until next Friday, I’m sure any couples being wed will be overjoyed, not least the thousands of people intending to close their streets and party thanks to the Royal family. I know from the reports of family & friends in Australia that it’s getting hysterical coverage in the media and the same is true here, although the merchandise available is simply incredible. And on the whole, pretty tacky. But before the craziness ahead of us this week, on Saturday (the nothing day between Good Friday & Easter Sunday) we went to Brighton on the train – a short journey to feel so far from the city! The sun was bright and warm as we left the station and headed down the streets straight for the water. 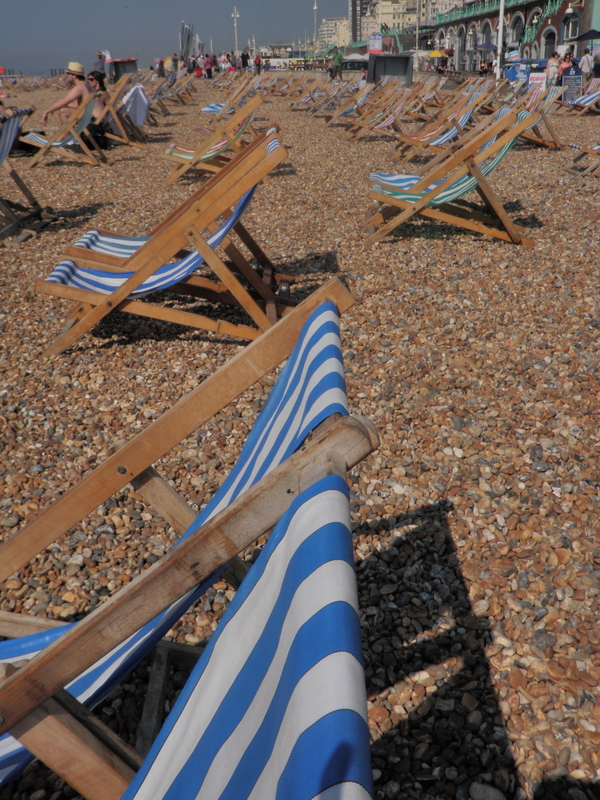 I was expecting the pebbles and the deck chairs, but the salt smell in the air and the slight aroma of sunscreen made me long for a summer day back home in Australia. I stood in the water for a little, enough to numb the chill away and we decided that it was time for a little something before extended sun exposure. Strolling up the ‘Lanes’ we found a little coffee shop where cake & sausage rolls were consumed before heading to the famous pier. 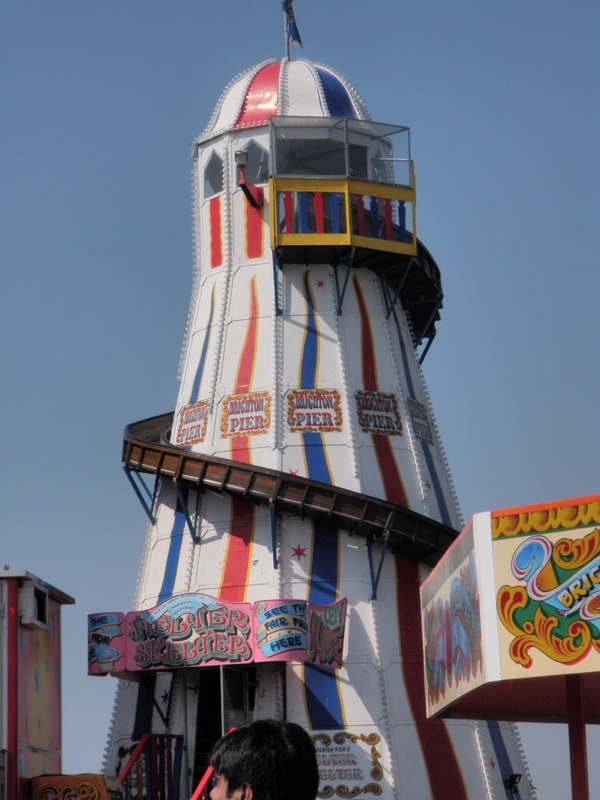 It’s almost overloaded with amusement arcade type things, donut stands, fairy floss, icecream (although only the soft serve stuff) and undercover areas full of slot machines and other things that go beep! and bing! At the very end are the cool rides, the cha-cha, a pretty exciting looking roller coasters called the Turbo and the Helter-Skelter, one of my favourites, song and ride. 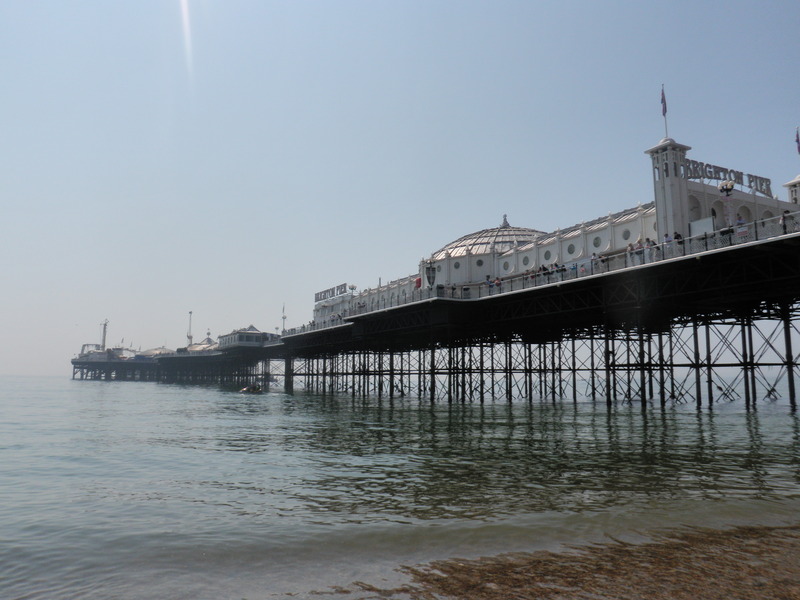 As I’m more used to amusement rides being in the middle of nowhere, on cement or bitumen, the novelty of Brighton Pier was large. 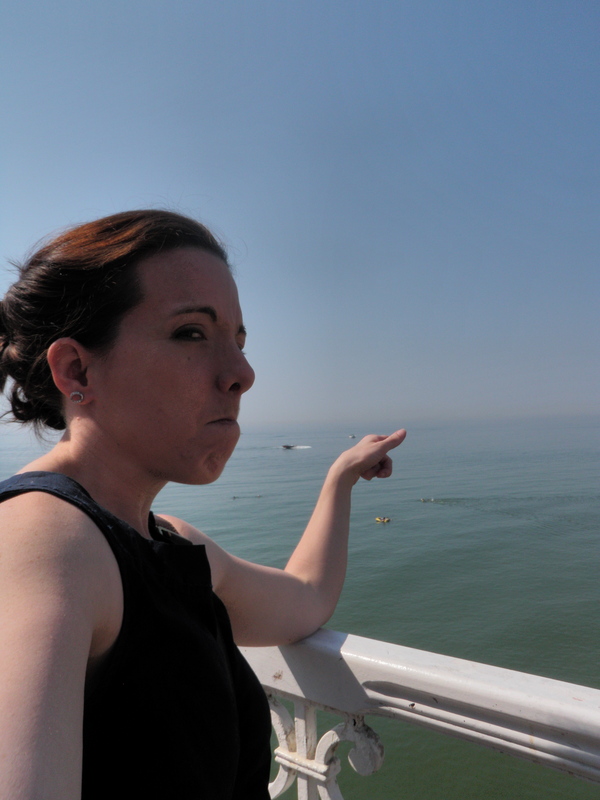 A rickety looking pier that holds hundreds of people and all those rides – how can that be safe? 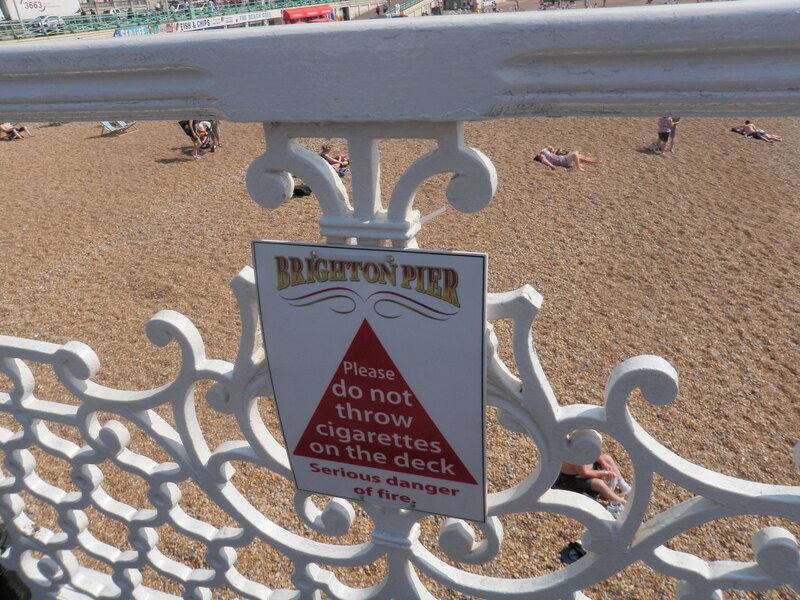 Never fear, there are signs that warn against putting out cigarettes on the pier – as if the burnt out husk of an old pier in the distance isn’t warning enough [see photo above]. 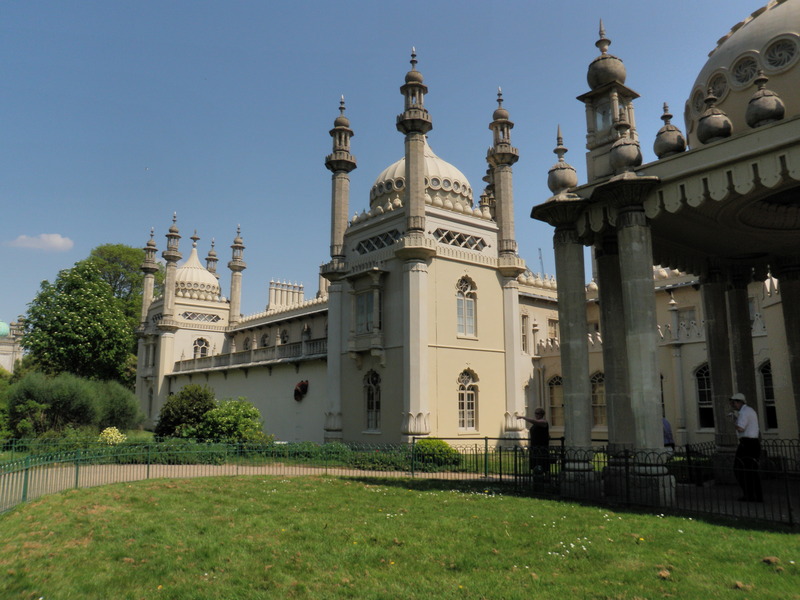 After a rather rocky (hee) sun bathe, we strolled up through the lanes in search of the Royal Pavillion, built when Britain was a glorious Empire and India was exotic and unattainable for so many. 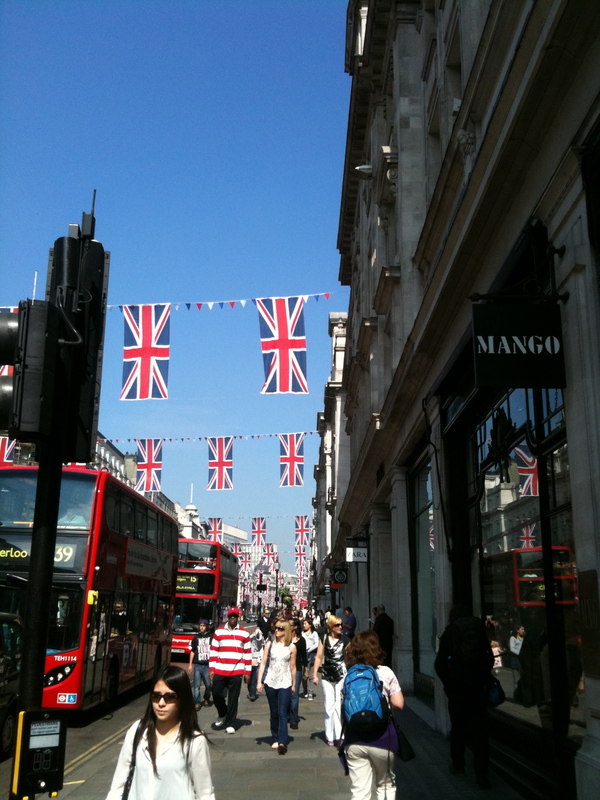 It was such a glorious day, the sun was hot enough that it was hard to think we were in England! Don't burn down the pier! I live in the world, and intend to explore it. 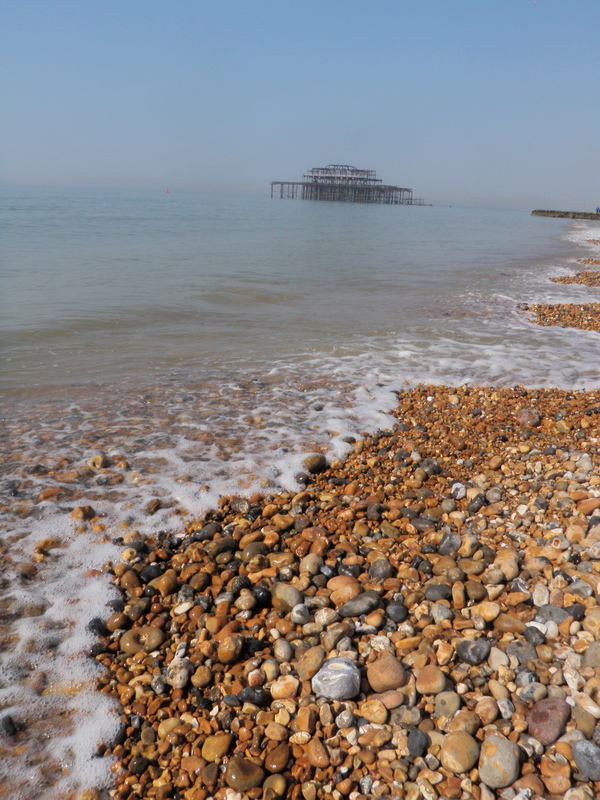 This entry was posted in England, Travel and tagged beach, Brighton, pier. Bookmark the permalink. 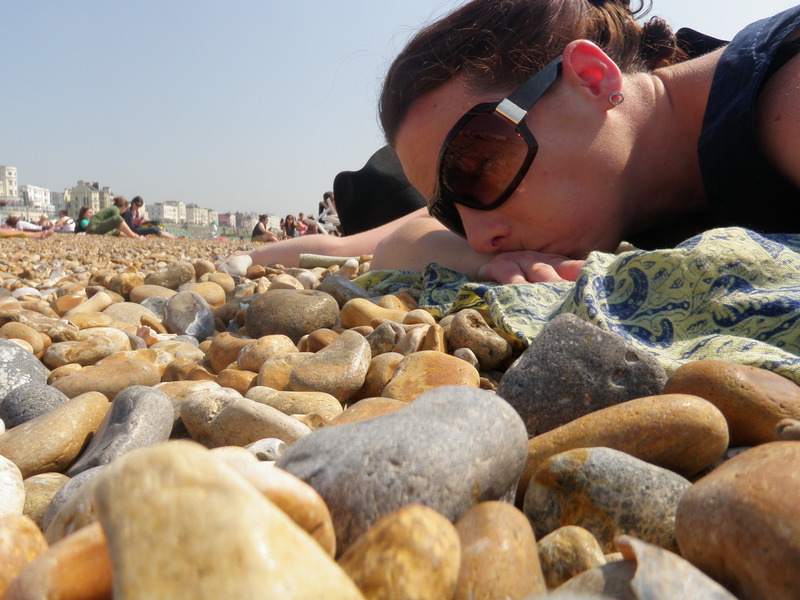 Puts new meaning into “hot rock day spa” – it’s free in Brighton! On Monday after the Anzac Day march I went to Manly and ate fish and chips in the misty rain. We were both in the wrong country!